Lighter and warmer than comparable expedition-weight parkas, the Expedition 8000 Jacket is a highly specialist down jacket, hand-filled in England and designed for extended use in the world’s most extreme high altitude and polar environments. Regularly trusted by mountaineers and adventurers alike, the Expedition 8000 Jacket has seen action in far-flung corners of the world, from Arctic Greenland and the polar ice caps to the Greater Ranges of Alaska and the Himalaya. 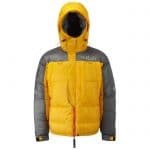 The latest incarnation of this legendary Expedition 8000 Jacket has been developed in conjunction with active Himalayan climbers and polar explorers. The jacket is filled with the highest quality 850FP RDS-Certified European Goose Down which is stitched with box-wall construction utilized specifically to eliminate cold spots. The Expedition 8000 Jacket uses extremely robust Pertex fabrics and includes a helmet-compatible down filled hood, 3 outer & 2 internal pockets, elbow articulations for greater freedom of movement, and mitt-compatible features like large zipper pulls.